This article provides a variety of recommendations for developing or expanding your employee wellness program. Limited budget? No problem. None of the recommendations in this article are expensive and most of them are free. In addition to long-term benefits like lowering health insurance premiums, you will learn of other benefits that can be achieved within a short period of time. Helpful and reliable website resources are also provided. 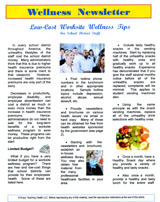 To receive this Newsletter for free, send your request to rborkowicz@EnjoyTeachingHealth.com and we will send you "Low-Cost Worksite Wellness Tips" as a PDF file. The PDF file will be sent to you as an email attachment. All work and no play can greatly limit employee participation in worksite wellness programs. By including activities that are actually enjoyable, you will increase participation considerably. This article provides a variety of activities that have been proven to maximize participation as well as improve employee wellness. From stress breakers to friendly contests, this article provides almost two dozen activities that are guaranteed to increase participation and increase fun. And remember, a happy employee is a productive employee. To receive this Newsletter for free, send your request to rborkowicz@EnjoyTeachingHealth.com and we will send you "Having Fun With Worksite Wellness" as a PDF file. The PDF file will be sent to you as an email attachment. How can you get expert medical speakers to make presentations for free? How do you plan an entire Inservice day for employee wellness? How do you follow-up on a successful wellness Inservice day? Learn the answers to these questions and many more in this newsletter. You will also learn how to obtain free wellness resources, start a wellness library, plan monthly wellness activities, plus much more. All of the Wellness Newsletters can be reproduced (up to 1,000 copies per year). 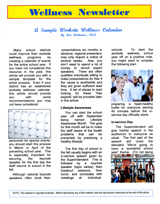 To receive this Newsletter for free, send your request to rborkowicz@EnjoyTeachingHealth.com and we will send you "Sample Worksite Wellness Calendar" as a PDF file. The PDF file will be sent to you as an email attachment. When walking or jogging…..What directions do most attackers come from? How does listening to music or talking on the phone reduce your safety level? What should you do if someone suspicious is following you? 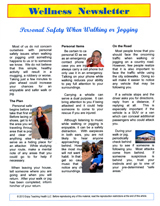 The Personal Safety When Walking or Jogging Wellness Newsletter will address these issues and many more. In addition to addressing personal safety issues, this Newsletter also includes information about exercising in weather that is very warm or very cold. All of the Wellness Newsletters can be reproduced (up to 1,000 copies per year). Over one million Americans suffer a heart attack or stroke every year and the risk factors for these diseases begin in childhood. Learn what happens in the body during these events, how they are caused, and what can be done to postpone or even prevent these health problems. 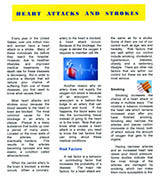 The Preventing Heart Attacks and Strokes Wellness Newsletter applies to adults of all ages. By adding a puzzle on the back of each Wellness Newsletter, requests for future Newsletters tripled. Therefore, each Newsletter includes two puzzles to choose from. All of the Wellness Newsletters can be reproduced (up to 1,000 copies per year). What is aerobic exercise? What is your maximum heart rate? Your target heart rate? This Newsletter explains the key concepts of aerobic exercise and provides recommendations as to exercise frequency, intensity, and warm-up/cool-down benefits. 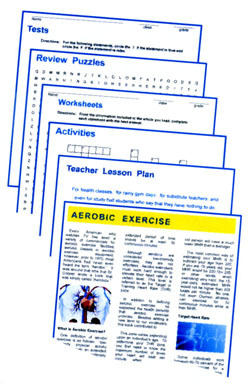 The Learning About Aerobic Exercise Wellness Newsletter can be utilized by the novice or advanced exerciser. By adding a puzzle on the back of each Wellness Newsletter, requests for future Newsletters tripled. Therefore, each Newsletter includes two puzzles to choose from. 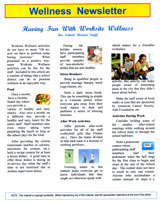 All of the Wellness Newsletters can be reproduced (up to 1,000 copies per year). Tired of all the misinformation advertisers provide when promoting their products? Some ads make it sound like using their product will keep you healthy forever. When it comes to cholesterol, here are the facts. Learn what cholesterol is, where it comes from, how it relates to a healthy lifestyle and why it is important to practice this lifestyle starting in childhood. 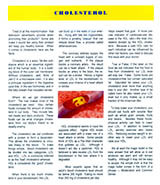 The Understanding Cholesterol Wellness Newsletter applies to adults of all ages. By adding a puzzle on the back of each Wellness Newsletter, requests for future Newsletters tripled. Therefore, each Newsletter includes two puzzles to choose from. All of the Wellness Newsletters can be reproduced (up to 1,000 copies per year). Tired of all the misinformation advertisers provide when promoting their products? Some ads make it sound like using their product will keep you healthy forever. When it comes to cholesterol, here are the facts. Learn what cholesterol is, where it comes from, and how it relates to a healthy lifestyle and why it is important to practice this lifestyle starting in childhood. 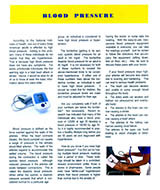 The Understanding Cholesterol Wellness Newsletter can be utilized by students as well as adults. Note: The contents of this Wellness Newsletter are the same as the information included in the Understanding Cholesterol Mini Unit. 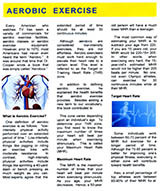 To receive a free sample Wellness Newsletter, send your request to rborkowicz@EnjoyTeachingHealth.com and we will send you a PDF file with the free Wellness Newsletter on Cholesterol. The PDF file will be sent to you as an email attachment. Diabetes in America has become epidemic among school-age children as well as adults. Yet most Americans do not understand what it is or how to reduce the risk of developing diabetes. In this Newsletter, you will learn about the different types of diabetes, the serious health problems caused by diabetes, and what you can do to reduce your chance of being affected by this disease. 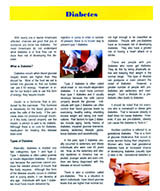 The Understanding Diabetes Wellness Newsletter applies to adults of all ages. By adding a puzzle on the back of each Wellness Newsletter, requests for future Newsletters tripled. Therefore, each Newsletter includes two puzzles to choose from. All of the Wellness Newsletters can be reproduced (up to 1,000 copies per year). What is aerobic exercise? What is your maximum heart rate? Your target heart rate? This Mini Unit explains the key concepts of aerobic exercise and provides recommendations as to exercise frequency, intensity, and warm-up/cool-down benefits. Also, the Learning About Aerobic Exercise unit includes a variety of learning level activities so that the teachers can select the levels that are most appropriate for their students. In addition to the Lesson Plan, short article, assignments and tests, this unit includes crossword and word search puzzles that MAKE LEARNING FUN. All material was created by a three-time Teacher-of-the-Year (including the American Association for Health Education Award - part of AAHPERD). Also, this lesson can be used for the entire class as well as for individual assignments, for homebound students, for non-participants in PE class, for extra credit, for make- up work, etc. Activities last from 15 to 50 minutes. Mini Unit arrives in PDF format. 41 pgs. © 2012. 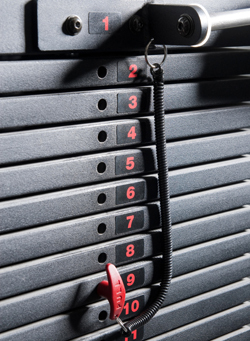 Which type of weight lifting program is best for you? How to prevent weight lifting injuries? This Mini Unit explains the key concepts of strength training exercise and provides recommendations as to exercise frequency, intensity, rest periods and benefits. Also, the General Weight Lifting unit includes a variety of learning level activities so that the teachers can select the levels that are most appropriate for their students. In addition to the Lesson Plan, short article, assignments and tests, this unit includes crossword and word search puzzles that MAKE LEARNING FUN. All material was created by a three-time Teacher-of-the-Year (including the American Association for Health Education Award - part of AAHPERD). Also, this lesson can be used for the entire class as well as for individual assignments, for homebound students, for non-participants in PE class, for extra credit, for make- up work, etc. Activities last from 15 to 50 minutes. Mini Unit arrives in pdf format. 36 pgs. © 2013. According to the National Institutes of Health, one out of every three American adults is affected by high blood pressure and this health problem is quickly spreading to school-age children. Learn the facts about blood pressure, how it is measured, the dangers associated with high blood pressure -- and what can be done to prevent it. 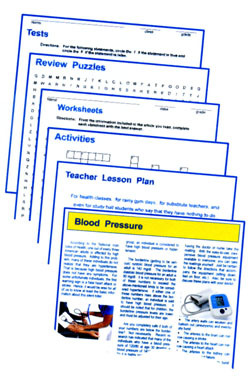 Also, the Understanding Blood Pressure unit includes a variety of learning level activities so that the teachers can select the levels that are most appropriate for their students. In addition to the Lesson Plan, short article, assignments and tests, this unit includes crossword and word search puzzles that MAKE LEARNING FUN. All material was created by a three-time Teacher-of-the-Year (including the American Association for Health Education Award - part of AAHPERD). Also, this lesson can be used for the entire class as well as for individual assignments, for homebound students, for non-participants in PE class, for extra credit, for make- up work, etc. Activities last from 15 to 50 minutes. Mini Unit arrives in PDF format. 38 pgs. © 2012. 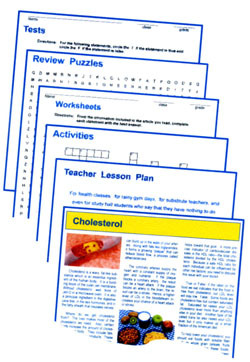 The Understanding Cholesterol unit includes a variety of learning level activities so that the teachers can select the levels that are most appropriate for their students. In addition to the Lesson Plan, short article, assignments and tests, this unit includes crossword and word search puzzles that MAKE LEARNING FUN. To receive the free Cholesterol Mini Unit, send your request to rborkowicz@EnjoyTeachingHealth.com. After receiving your request, we will send you the Cholesterol Mini Unit in PDF format as an email attachment. Diabetes in America has become epidemic among school-age children as well as adults. Yet most Americans do not understand what it is or how to reduce the risk of developing diabetes. With this unit, you will learn about the different types of diabetes, the serious health problems caused by diabetes, and what you can do to reduce your chance of being affected by this disease. 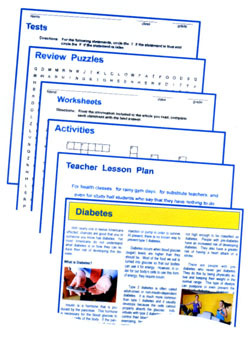 Also, the Understanding Diabetes unit includes a variety of learning level activities so that the teachers can select the levels that are most appropriate for their students. In addition to the Lesson Plan, short article, assignments and tests, this unit includes crossword and word search puzzles that MAKE LEARNING FUN. All material was created by a three-time Teacher-of-the-Year (including the American Association for Health Education Award - part of AAHPERD). Also, this lesson can be used for the entire class as well as for individual assignments, for homebound students, for non-participants in PE class, for extra credit, for make- up work, etc. Activities last from 15 to 50 minutes. Mini Unit arrives in pdf format. 37 pgs. © 2012. 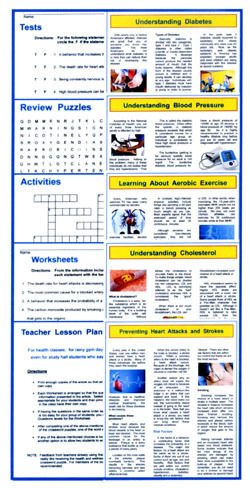 Also, the Preventing Heart Attacks and Strokes unit includes a variety of learning level activities so that the teachers can select the levels that are most appropriate for their students. In addition to the Lesson Plan, short article, assignments and tests, this unit includes crossword and word search puzzles that MAKE LEARNING FUN. All material was created by a three-time Teacher-of-the-Year (including the American Association for Health Education Award - part of AAHPERD). Also, this lesson can be used for the entire class as well as for individual assignments, for homebound students, for non-participants in PE class, for extra credit, for make- up work, etc. Activities last from 15 to 50 minutes. Mini Unit arrives in pdf format. 40 pgs. © 2012. 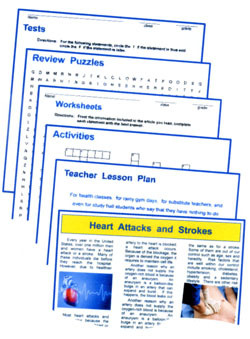 Developed by Ron Borkowicz, National Health Education Teacher of the Year, each unit includes a variety of learning level activities so that the teachers can select the levels that are most appropriate for their students. In addition to the Lesson Plan, short articles, assignments and tests, each unit includes crossword and word search puzzles that MAKE LEARNING FUN. Also, each lesson can be used for the entire class or for individual assignments, for homebound students, for non-participants in PE class, for extra credit, for make- up work, etc. Activities last from 15 to 50 minutes. Mini Units arrive in pdf format. According to the National Institutes of Health, one out of every three American adults is affected by high blood pressure and this health problem is quickly spreading to school-age children. Learn the facts about blood pressure, how it is measured, and the dangers associated with high blood pressure, and what can be done to prevent it. Discount Price $69.00 Save $10.80! In addition to the contents included in the product description, each Lesson Plan Package also includes the following features. A 20 to 30-minute Presentation that can be played on a DVD player, PC or Mac. The presentations are created with a game-like format which has been proven to enhance student interest. Tests and Assignments for various ability levels. Suggested Reading Articles for student reports and research papers. Crossword and Word Search Puzzles that can be used to review material and to reinforce the correct spelling of topic terminology. Substitute Teacher Lesson Plan. This resource can be used by the course teacher as a regular lesson plan. Also, this resource has been prepared so that the lesson can be taught by someone who does not know anything at all about the subject matter. In addition to using these products to teach students in the standard way, the resources can also be used as follows. Each product includes crossword and wordsearch puzzles that MAKE LEARNING FUN. Alternate work for homebound students or for students who cannot participate in physical activity such as physical education class. Take-home assignment for students who were absent the day the lesson was taught in class. Assignments and Tests not used during the regular classroom instruction can be completed by students for extra credit. The crossword and word search puzzles are excellent motivators for reviewing key unit terminology. Even study hall students who say that they have “nothing to do” enjoy completing these puzzles. Substitute Teacher Lesson Plan can be used as a regular lesson by the classroom teacher or can be kept as a lesson plan when the classroom teacher is absent. Teachers, teach your students to….. Developed by a three-time Teacher-of-the-Year and instructor for Nationally Certified Athletic Trainers, this resource helps students to become their own Personal Trainer. What are the key concepts of aerobic exercise? What is the difference between exercising for health vs. exercising for fitness? Detailed answers to these questions plus many more are included in this resource including recommendations for warm-up and cool-down exercises, exercise frequency and intensity, preventing exercise injuries, health benefits, plus much more. All of the time-consuming work has been done for the teacher. And because of the game show format used in the presentation, the students are highly motivated to pay attention to the material. (For Grades 6-12). © 2011. Teachers , teach your students to….. Developed by a three-time Teacher-of-the-Year and instructor for Nationally Certified Athletic Trainers, this resource helps students to become their own Personal Trainer. What are the key concepts of Strength Training exercises? What is the difference between general strength training vs. Power Lifting vs. Olympic Lifting? The difference between Absolute Strength vs. Dynamic Strength? Detailed answers to these questions plus many more are included in this resource including recommendations for exercise frequency, exercise intensity, overload principle, preventing exercise injuries, health benefits, plus much more. All of the time-consuming work has been done for the teacher. And because of the game show format used in the presentation, the students are highly motivated to pay attention to the material. (For Grades 6-12). © 2011.